Google Drive is a handy way to share files across multiple computers, or back up files into the cloud. Naturally it integrates seamlessly with Android, and Google provide a client for use on Windows and the Mac, so you can keep you tablet, phone and PC all synced up. Unless you use Linux that is. Because unlike Dropbox, there is no official Linux client for Google Drive. Fortunately, help is at hand in the form of Insync. Insync is a full featured proprietary Google Drive client. I’m focusing on Linux because it was trying to find a Google Drive client for Linux that led me to Insync, but it is also available for Windows and Mac. Unlike the official client, it supports multiple Google accounts, if you have a need for that sort of thing. 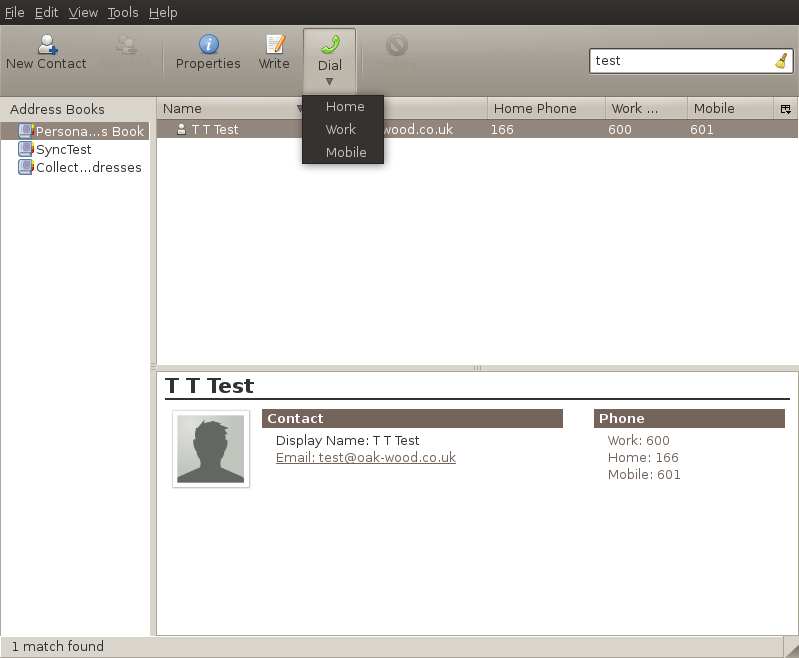 I have it installed on a laptop running Ubuntu 12.04 and it seems to do what it says on the tin. It constantly monitors a configured directory and keeps it in sync with my Google Drive account. It can handle having symlinks in the directory, so for example I’ve symlinked my Shotwell data directory to make sure that is backed up. And it can automatically convert Google format documents to LibreOffice format on the fly. It also supports selective syncing, allowing you to exclude certain folders from syncing. I’ve only had it installed for ten days or so, so it’s a bit early to tell if it functions reliably, but I’ve had few problems so far. The one niggling issue is that sometimes it fails to start at system startup, but support from Insync staff has been responsive so I suspect this will get sorted out soon. Much Linux software is open source and distributed free of charge, so using proprietary, paid for software may come as a bit of a shock to some Linux users. If you have some deeply held philosophical objection to closed source this is not going to be for you, but otherwise it is definitely worth a look. The cost is far from prohibitive—the consumer version is $10 per Google account. When you consider that beyond the basic free allowance Google Drive is significantly cheaper than Dropbox you could quickly save this if you need more than a few gig of space. Cost over a year with 100GB of storage, including software purchase, would be $69.88 with Google + Insync consumer, or $99 with Dropbox. If you want to try it out Insync is available on a 15 day free trial. To be honest, unless you make a lot of use of Google Drive this is not really long enough to evaluate something that just works away in the background. It’s also perhaps one place where the Insync team are missing a trick—it’s certainly not long enough to get you hooked. I suspect if they bumped this to six months they’d find a lot of people install it, forget about it, learn to take it for granted, and then pay for it a soon as they realise they’re about to be without it. This entry was posted in Technical and tagged dropbox, google drive, insync, linux, review on October 24, 2013 by Chris. I’ve had my first go at developing an extension for Thunderbird, the open source email client from Mozilla. The unimaginatively named TBDialOut is an extension that enables the user to place a phone call direct from Thunderbird’s address book. I’ve actually been using an extension that does this for quite a while—VOIP3Dialer 1.1. But I recently upgraded to Thunderbird 3.1.7 from 2.something-or-other and VOIP3Dialer didn’t work with TB3. I really wanted to keep the funcionality that VOIP3Dialer offered, and with it not having been updated since July 2008, and its support web page gone it seemed there wasn’t much option but to learn how these extensions things work. It didn’t take long to work out what had changed in Thunderbird’s address book to break things. That sorted, I started to look around a bit more and get to understand the inner workings of an extension. 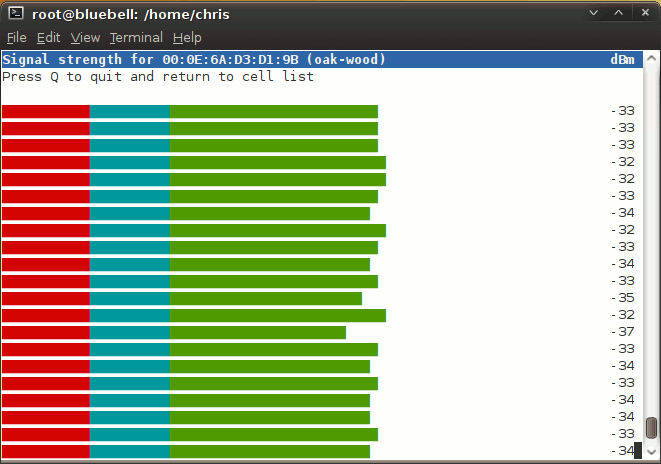 I ended up rewriting pretty much all of the functional code in VOIP3Dialer, and then started adding stuff. TBDialOut introduces various user options, including a choice of URL schema to use and international dial prefixes. I then tackled the user interface. I added clickable links as well as the original context menu items and three buttons and made a few other usability tweaks. Finally, I changed the three buttons for a single, combined button that prompts the user to select which phone number to dial (home, work or mobile (cell phone)). TBDialOut basically just passes the selected phone number to which ever programme is configured to handle the URL scheme you’ve chosen to use with TBDialOut. You can choose from sip:, tel:, callto: or skype:. I’m using it with a small Perl script that contacts my Asterisk server to set up a phone call. When I click on a number with TBDialOut the phones in the house ring out. Pick one up and you’re connected to the number you clicked. This entry was posted in Technical and tagged asterisk, dial, extension, phone, TBDialOut, telephone, thunderbird, voip on January 13, 2011 by Chris. Well no, not really. But Pifimon does do a little of what NetStumbler does. 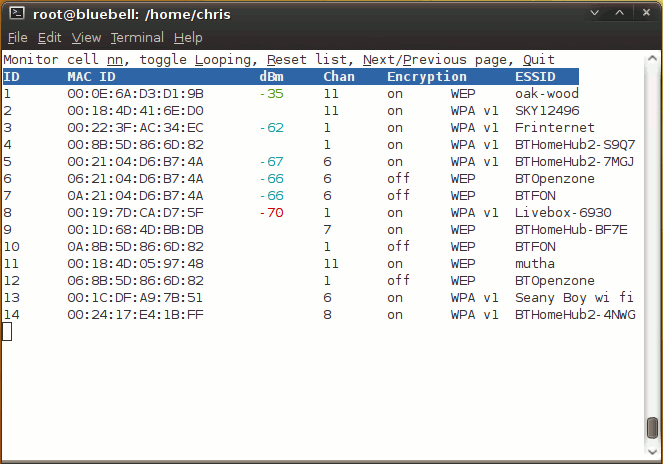 Pifimon is a small programme to monitor wireless networks under Linux. It is written in Perl and works by presenting the output of iwlist in a more friendly, and constantly updating, way. Pifimon supports several wireless card drivers, and provides a way to extend support to other drivers. You can download the latest version (pifimon-0.4rc2.tar.gz) or get Pifimon from Github. For various reasons I’ve become interested in building antennae to boost wifi coverage. I needed some way to get a constantly updating representation of signal strength to help test and align antennae. The thing most people seem to use is NetStumbler, but NetStumbler only runs on Windows. Most of my machines, and in particular the netbook I plan to use for testing, run Ubuntu. After a bit of Googling I came across scanmeter, a bash script that processes the output of the Linux `iwlist scan` command to produce a histogram. Just what I needed! Well nearly, but the great thing about open source is that if it’s not quite right, you can change it. 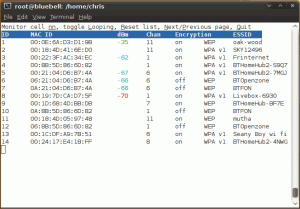 This entry was posted in Scripts, Technical and tagged iwlist, linux, netstumbler, perl, pifimon, wifi, wireless on July 31, 2010 by Chris. This is going to be a very techy article, so if that’s not your thing, turn away now. 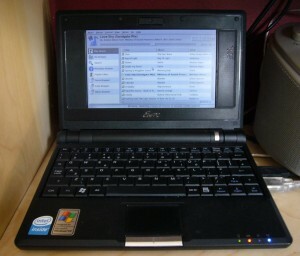 I’m using an Asus EeePC 701 that I picked up on ebay for £71 to play the music. It basically has Ubuntu installed, but tweaked to be as minimal as possible. Music is on the file server upstairs, mostly as FLAC files. The EeePC runs Music Player Daemon (MPD), a music server that can be remotely controlled across the network by a variety of clients. A very minimal GUI is loaded at startup with the Gnome Music Player Client (GMPC). Starting everything is as simple as pressing the power button—no logging in or starting things up. Also on the EeePC is Remuco, which allows remote control from my Nokia phone. 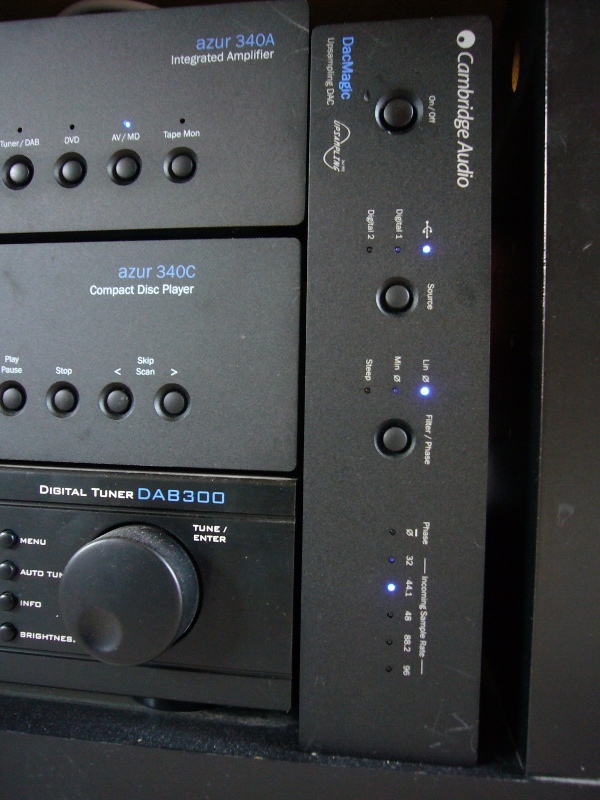 Rather than relying on the ropey internal sound card, the digital signal is taken from the USB port to a Cambridge Audio DacMagic upsampling DAC, and on to my existing Cambridge Audio Azur 340A amp. I chose the Asus EeePC 701 for a number of reasons. I have an EeePC 901 and I’ve been very pleased with it, so I trusted the pedigree. It has a solid state hard drive, so there is no clattering drive noise to interfere with listening. It’s small and fits easily on the shelf next to the hifi. And second hand ones come up regularly on ebay at a reasonable price. It might have been a bit of mistake to be honest. I hit a couple of problems. One is that it seems to run hotter than the 901, so the fan comes in more, but to be fair it’s not really noticeable. More of an issue has been the wireless chipset – the Realtek RTL8187SE. Support for this under linux seems incomplete, and though it works fine with NetworkManager once a user is logged in, I couldn’t persuade it to come up at boot time. Consequently, I ended up investing in a Zyxel G-202 USB wireless adapter instead. I did manage to kludge the internal thing to work using NetworkManager, but that meant the network wasn’t started until late in the boot process, which delayed various other things. Switching to the well supported Zyxel adapter shaved 20s off the boot time, taking it down from 65s to 45s. The Cambridge Audio DAC Magic is a lovely piece of kit. It’s an upsampling DAC with more acronyms in it’s specification than you can shake a stick at. Even I’m not geeky enough to understand what half of them mean. But it sounds great, and what else matters? Well, the fact that it does what I need matters actually, which is to take USB input from a PC. And the fact that it seems to be fairly easy to set up a linux based machine to recognise it as a sound card. My starting point was to install Ubuntu Netbook Remix on the EeePC. A slimmer distro might have made sense, but I figured UNR has been tweaked for various netbooks and I might save a fair bit of messing about with hardware drivers if I started with it. Having installed UNR I created a second user named ‘music’, as an ordinary desktop user. This will be the user who will automatically log in to the EeePC. I’ll keep my own account for administration. I then used Synaptic Package manager to install mpd, gmpc, gmpc-plugins and remuco-mpd—the basis of the music system. I needed a couple of other packages too. nfs-common enables me to access the music stored on the fileserver upstairs; and mingetty will help me to automate some login tasks. The aim was to have a system that can be turned on with nothing more than a touch of a button, and that boots fairly quickly, bringing up as little of the GUI as possible. Various suggestions were made to me about session files and using gdm, but I found it actually quite difficult to use gdm and not get a lot of extra desktop guff. So I gave up. The simple way is to configure your wireless network in NetworkManager and then check the “Available to all users” box. NetworkManager won’t start a wireless network until a user logs in it seems, but a console login will do the trick. The trouble with this approach is it delays the start of the network, and I found that in order for things to work I had to be sure the network was up and the remote directory with all the music in mounted before starting MPD. So I looked for a way to start the network earlier. Connecting to the network share should be as simple as putting the appropriate entry in /etc/fstab. Unfortunately, it wasn’t. 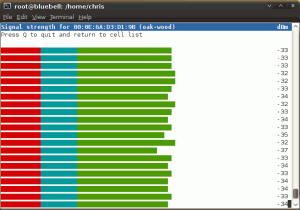 The problem seems to be that /etc/fstab is processed before the wireless network has finished coming up. It turned out to be fairly critical that things are done in the right order, and that one thing finishes before the next starts. Otherwise odd things happen. Configuration of MPD is done mainly by editing /etc/mpd.conf. The distribution includes sensible defaults for most things, and plenty of comments. You’ll need to set music_directory to the directory beneath which all your music is stored. Also check the value of bind_to_address. Do not set this to ‘localhost’ if you want to able to control the system remotely. I simply commented this line out, as the default is to bind to all available addresses. The next thing to do is to disable MPD. I know, that sounds weird. It’s back to this problem of the order that things are done. By default MPD is configured to start automatically at boot time. The problem is, it gets rather unhappy if it is started when music_directory isn’t there yet. So we’ll stop it from starting at boot, and start it later from a script. This is the script I used. It is quite specific to my set up, so you’ll need to go through and change stuff. Basically, it runs only when the wireless network comes up and then uses a series of while loops to wait until things are ready before moving to the next stage. # interface comes up, which isn't useful! echo -n "Waiting for network ." echo -n "Waiting for music directory to be available ." Now we should be in the position where running ‘startx’ as the music user will not launch the whole Ubuntu desktop, but just GMPC, maximised and with no title bar. echo -n "Waiting for MPD to start *"
OK, that should be it. Restart the EeePC and it should load everything and start the GUI music player. The beauty of MPD is that it can be controlled from other PCs on the network. There is a wide range of client software available. I’ve found GMPC, combined with some of the big selection of plugins, suits my needs best. Ario is another good client, as is Minion, an add on for Firefox. The MPD website has a whole list of clients. This bit’s great! 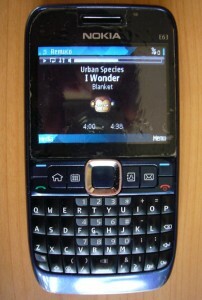 Using Remuco the music player can even be controlled from a mobile phone. Remuco is a little different to other MPD clients. It doesn’t use MPD’s interface directly, but relies on a helper application, remuco-mpd, being installed on the server (the EeePC in this case). But it works well, and is really useful as my phone is always on and to hand, whereas, believe it or not, I do occasionally turn my laptop off. There’s not much point in having a quality DAC and amp and feeding poor quality music files to it. Much of my CD collection I ripped out a few years for the purpose of playing it on an in-car CD player that played MP3s. It was done in a hurry just before a journey to the Hebrides. Tinny speakers and a noisy old diesel car meant it didn’t really matter if the quality was less than perfect, so I used bitrates of between 128 and 160kbps. Great! I’ve done some entirely subjective listening tests comparing FLAC files played over this system with the original CDs played on a Cambridge Audio Azur 340C CD player. If anything, the FLAC sounds better—a touch clearer, brighter and more defined. 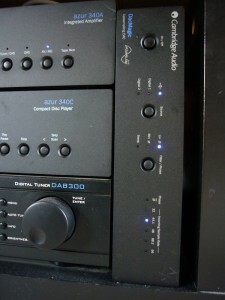 This isn’t surprising—the 340C is quite old now and the DAC in the DAC Magic is superior to that in the 340C. Since FLAC is lossless, the input hitting the DAC Magic should be a bit perfect copy of the CD. I’m certainly very pleased with it, and it sure beats having to change the CD every 45minutes! 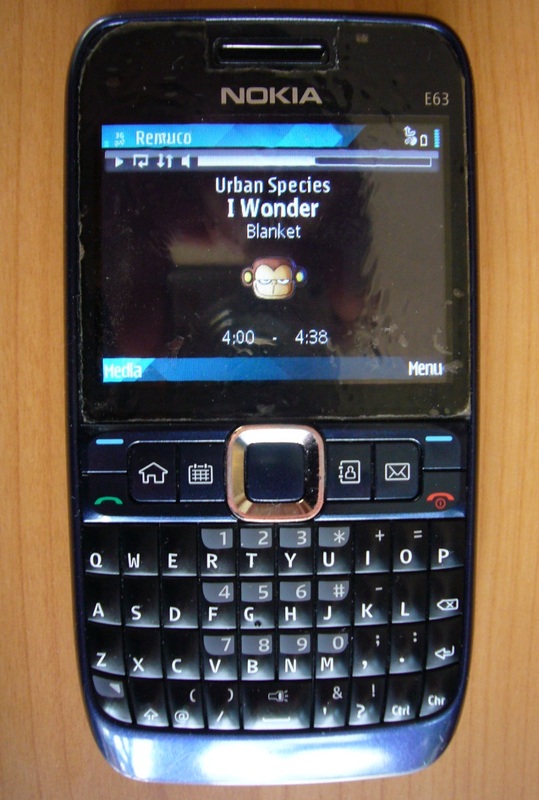 This entry was posted in Technical and tagged cambridge audio, dac magic, eeepc, hifi, mpd, music, music player, ubuntu, ubuntu netbook remix on May 15, 2010 by Chris. On 1 April the Ordnance Survey finally opened access to data relating to the location of Britain’s 1.7 million postcodes. It’s long been a gripe of many that these data were not publicly available, and various projects have attempted to collate openly available postcode data, such as Free The Postcode and http://www.npemap.org.uk/. A while ago I wrote a PHP class for manipulating postcodes, and in particular for calculating the distance between two postcodes. I wrote it for use in a utility to help people find their nearest reputable tree surgeon by searching on their postcode, which is how it came to be named FindMyNearest. Until now I’ve relied on data gleaned from open sources, often incomplete and of unknown accuracy. I used data only down to postcode district level (eg SW1A, CV32) and stored that in a delimited text file. With the release of Code Point Open I now have the opportunity to use full postcodes of reliable provenance. The problem was that there are about 1.7 million postcodes in Great Britain. It was fairly clear that code which used a text file for storage and slurped the entire contents into memory wasn’t going to cope well with this. So I went back to the drawing board. I’ve rewritten FindMyNearest to provide a kind of data abstraction layer. It now supports ‘drivers’ for different types of data store. The text file option is still there, but I added the ability to use a MySQL server to store the data. Then I came across UK Postcodes, a system based on Code Point Open put together by Pezholio. UK Postcodes provides a simple API for fetching a range of data about a postcode in XML, JSON, CSV or RDF formats. I figured it wouldn’t be too hard to add a driver that utilised this, so I did just that. This entry was posted in Scripts, Technical and tagged code point, code point open, FindMyNearest, PHP, postcode, uk postcodes on April 29, 2010 by Chris.